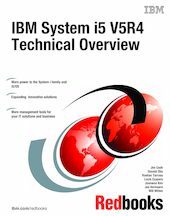 This IBM Redbooks publication provides a technical overview of IBM System i family hardware and i5/OS-based software at Version 5 Release 4 level. It is intend for those already familiar with System i and i5/OS who need a broad perspective of what is new with V5R4 either to consider upgrading to V5R4 or to take full advantage of V5R4 capabilities. Several V5R4-based licensed program capabilities are also included. These include Lotus products, WebSphere Application Server versions, WebSphere Development Studio for iSeries capabilities, and IBM Director for i5/OS capabilities. Selected i5/OS V5R3 level content is included where the developers of this book determined that the function should be included. Support introduced with V5R3 is clearly noted. This information is generally of an intermediate level of detail. Providing this information in one place is an ideal way to obtain a good understanding of capabilities. This book refers the reader to sources for more detailed information about specific topics.